This is established manufacturer that focuses primarily on pistol and smaller handgun safe. Their main specialization lies in the biometric fingerprint gun safes. However, they are also known for old-school physical key locking gun safes. You won’t find many large models from the GunVault stable, and if you are considering investing in a safe for your pistol or a smaller safe, then you will be very pleased with GunVault gun safe. You will find other small gun safes from other manufacturers, but GunVault is the number one industry leader when comes to smaller gun safes. 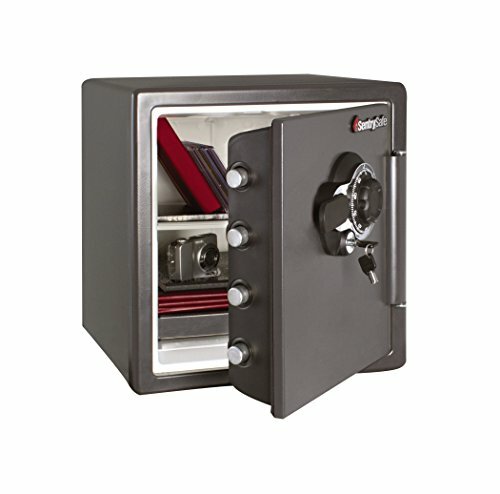 They are known for their quality and sturdy gun safes that carry an impressive 5-year fire and theft warranty. The GunVault team knows what it takes to deliver top-rated gun safe, built with premium quality steel, and they are the only manufacturer in the smaller handgun safe market that offers this kind of warranty. If you are looking for a gun safe to store your valuable documents and handguns, you should seriously consider a gun safe from the reputable company. You can start by browsing through the GunVault gun safe reviews below and check if you find anything that matches your demands. Having said that, we will begin by looking at the top products from GunVault and hopefully one of the items fit your style and needs. 2 Why Should You Consider GunVault Brand? Dimensions: 1½" x 6½" x 9½"
First up is the brilliant SpeedVault handgun safe that is a fantastic solution for those who are looking for a way to keep their pistols secure, safe and ready at all times. The locking mechanism consists of high strength technology that ensures that all your valuables are secure inside the vault. You can choose between two different styles to match your demands. One option is a biometric gun safe, and the other offers a combination lock. Both versions are constructed from premium 18-Gauge steel to maximize the protection. Moreover, you will receive two backup override keys so you can be sure that you can always access the safe at all times. Once you open the safe, an interior light will illuminate, so you can clearly see your belongings, even in low light situations. To power-up the light and lock, there is also a 9-volt alkaline battery included with your purchase. The installation is easy, and you can gain access to your belongings in no time at all. Moreover, the interior is covered with soft foam to prevent any damages to your gadgets. On top of all these great features, GunVault offers a five-year warranty for fire and burglary. 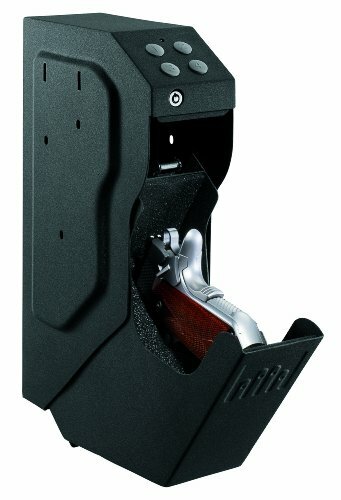 Here is an excellent biometric or combination solution for those who need a small gun safe. There is enough room for a small handgun and ammo. It is built from 20-gauge steel and comes in a sturdy black finish. One of the best features of MV500 is the locking mechanism. 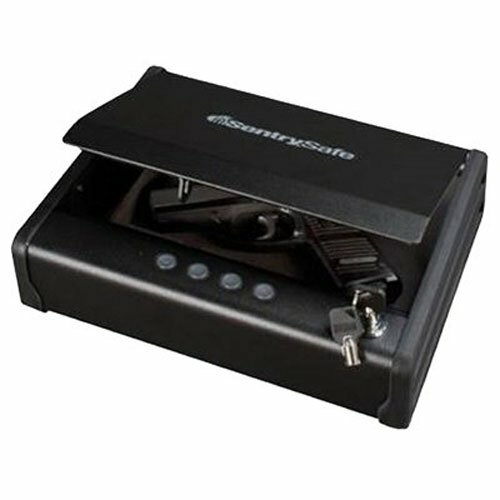 It was developed to provide ultra-secure and reliable access to your items inside. This is one of the sturdiest and durable handguns safe on the market and almost impossible to pry-open. Another brilliant feature is the No-Eyes technology that allows you to set your own secret code with up to 120 fingerprint combination options. This unit also comes with a tamper detection that locks the keypad if you enter more than 24 incorrect entries. Once the tamper detection is triggered, the unit will enter sleep mode for 2 minutes that prevents any further attempts. On the whole, your handgun and other items will be within reach in any emergency situation. It doesn’t even matter if it’s dark because you can easily access it without a key, thanks to the No-Eyes technology. The MV500 is also perfect for those who are looking for a handgun safe to store in their car using the included security cable. That way, your safe will be a real headache for anyone who tries to steal the safe. 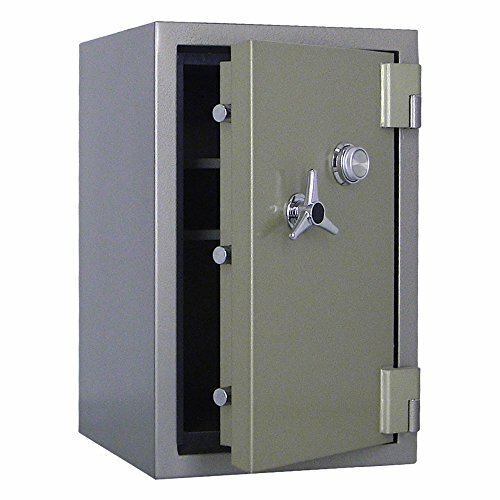 If you are planning to invest in this safe for your home, then you should consider bolting it down and use the security cable to maximize its protection. Next up is the GV1000C-DLX Mini Deluxe that is built from top-notch quality steel and features many bells and whistles to ensure that your handguns are safely stored inside the vault. There is an audio alarm or so-called motion detector that kicks-in when anybody tries to tamper with the locking mechanism. Also, when the battery level is low, the audible alarm beeps to ensure that you will never experience power loss. 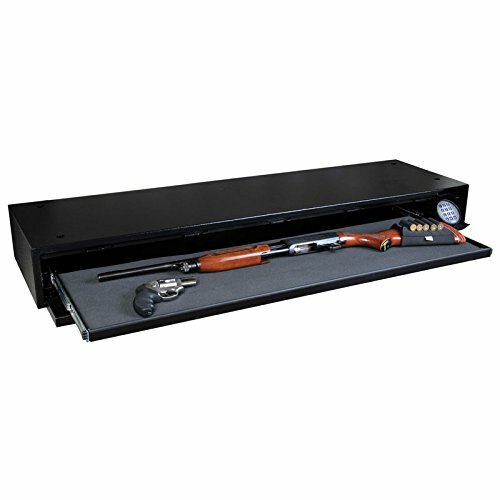 Just like every GunVault gun safe, this unit is heavily crafted and is constructed from quality 16-gauge steel with tamper-free locking mechanism and a built-in computer that kicks-in immediately if you repeatedly enter the incorrect code. This gun safe was built to provide you with quick access to your firearm in any situation. There is also a convenient interior light that illuminates once you open the door. That way, you will immediately see inside the safe, even during the darkest hours. There is also a connection jack for AC/DC power source and 9v battery power that delivers security and portability in one package. Overall, this is a user-friendly gun safe that enables you to set almost unlimited different combinations for three users. It is also possible to disable the audio beep if you want your access to be completely silent. However, if you disable it, you will not be alerted if you enter the wrong key and that might delay you from accessing your firearm. Our next pick is another quality GunVault unit that has been receiving great reviews from costumers that love the accessibility, reliability, portability and the price tag of this gun safe. The GV1000S Mini features everything that you need to secure your firearms and other valuable belongings. This gun safe has been highly favored by those who are looking for a gun safe to travel with or to install in a vehicle. It is very easy to carry around, and you can easily store two handguns in it. It is important that you can rely on your gun safe every time you need access. 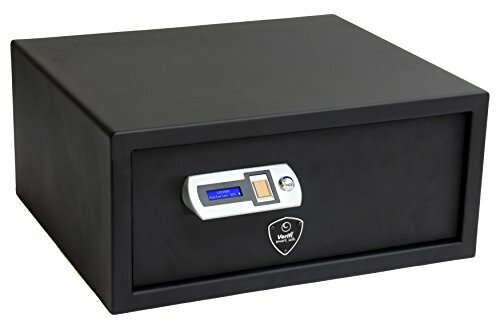 The GV1000S is regarded as being one of the most reliable gun safes on the market today, and you can count on it to open every time you enter the right code. Moreover, you can always see if anyone has tried to tamper with the safe because the safe records every failed attempt and provides you with a log to keep you informed. 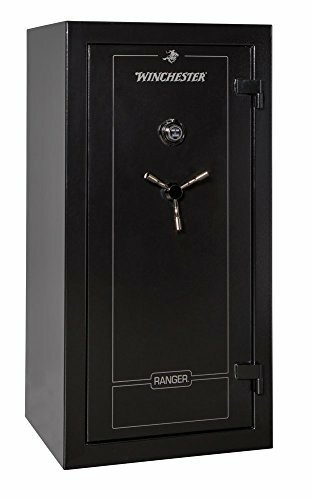 The construction features only top-notch material, and this unit is crafted from a quality heavy gauge steel that delivers security on a scale that only few portable gun safes can offer. This unit passed all the highest security requirements from the California Department of Justice and is stamped as tamper free gun safe that does not crack open if dropped from a high altitude. Overall, here is an ideal solution for those who are on a tight budget and need a gun safe to store their handguns along with other small belongings. 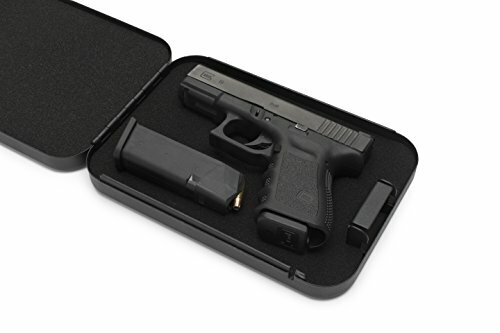 This unit is extremely well-built on the outside and inside and is coated with a rug on the inside to ensure that you won’t scratch your pistol or other valuable items. 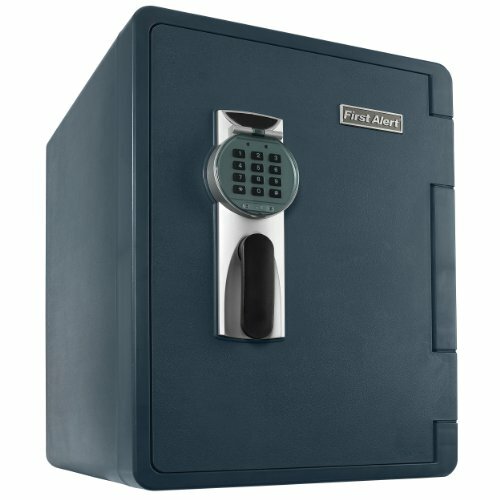 This gun safe comes with a 5 year warranty against theft and fire. Here is a very affordable gun safe if you are looking for a unit that can deliver maximum safety for your firearms and other valuables. It features a heavy-duty construction, rugged interiors, and adequate space for storing all that you need to keep locked away. This is a superior and highly developed gun-safe that comes with excellent safety and tamper-proof mechanism that you won’t find in any other gun safe. Your firearms will be safely stored, away from any unwanted individuals. Nevertheless, it is very easy to access during any situations, even during the darkest hours. One of its main features is the easy-to-program, no-eyes keypad and touch buttons that enable you to select from countless different security codes. Moreover, current owners highly appreciate the rugged interior that was designed to protect everything you store inside the safe. There is a shelf that splits the gun safe into two sections. That way, you can store your pistol in one section and keep the firearm separated from other items in the gun safe. This gun safe is fairly compact and measures 15 x10.5 x 8.2 inches. If you have several guns, you can expect to store up to 3-4 pistols inside the GV2000C. There are two override keys included that allow you to access the safe at any event. Along with the physical key, the No-Eyes keypad technology provides you with quick access, even in dark conditions. 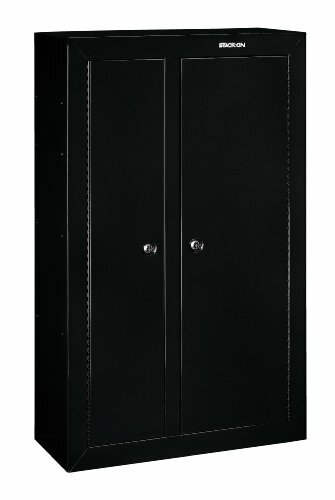 At last, the industry leading 5 year burglar and fire warranty applies to this gun safe. Next up is our top budget-friendly pick on the list and this is the NanoVault 200 that measures 9.5 x 6.5 x 1.75 inches. This gun safe was built to provide more and satisfying storage solution from the previous NanoVault 100 version. The NV200 offers excellent storage if you own several handguns. The lock mechanism consists of a physical key system, so there are no complicated digits or coding involved accessing your pistol. However, you will need to store the key in a safe place that allows you to access the safe quickly at all times. Once you open the safe, you will see that the interior is padded to ensure that your belongings are protected from scratches and damages. Here is a great option if you need a portable gun safe in your vehicle and this unit should perfectly fit under the car seat. You can even store it in the cupboard or drawer. Thanks to its portability and compact size, you can easily hide it anywhere in your house or your car as it will fit into places that you could never imagine. Overall, this gun safe offers simple storage solution that is very easy to hide. It features 18 Gauge steel construction and comes with a 1,500 lb tested security cable. Moreover, the Nv200 is the only portable gun safe on the list that meets TSA Airline firearm guidelines. On top of that, your purchase is protected by the 5 year exclusive full warranty for fire and burglary. Next up is the brilliant Microvault XL that offers more storage space than most of the portable items on the list. You should seriously consider this unit if you are looking for a portable but durable gun safe to store in your vehicle or your bedroom drawer. The lock mechanism allows you to store 120 different combinations of your fingerprints. It is a biometric scanner that was built for swiping and comes with a learning curve to master its potential. Here is another cheap scan solution for those on a budget. 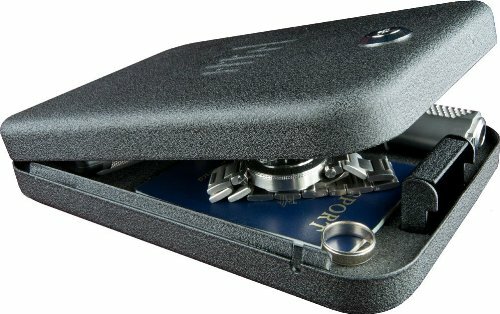 The Microvault XL opens up like a briefcase once you scan your fingerprints. The inside pockets are perfect for smaller items like your phone, wallet or money instead of placing it next to your firearm. The interior is fully coated with foam, so everything is protected even if you decide to take the safe with you on the go and drive around on a bumpy road. Industry leading, high strength lock system ensures maximum security and the housing features an 18 gauge steel to boost the security even more. The package also includes a security cable and two backup override keys. The 5-year warranty covers your purchase against theft and fire. Next is the GV2000S and here is a unit that provides excellent versatility when comes to organizing the space inside the gun safe. It includes a shelf that divides the safe into two parts. With two sections, upper level and lower level, you can store two small pistols in each section. There is also a four-button programmable keypad that runs on 9 Volt battery, and there is also a physical key for backup. 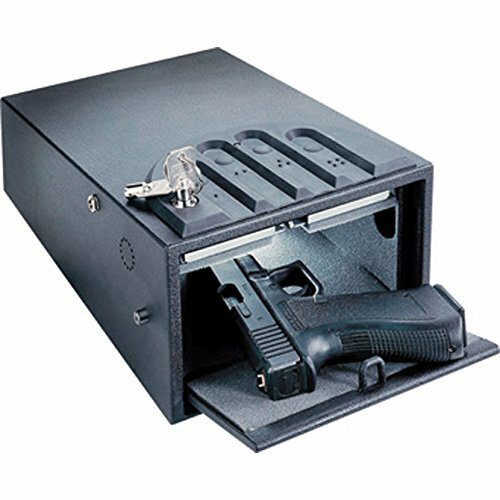 The safe is completely covered with soft foam to protect anything that you store in the gun safe. The housing consists of durable 16-Gauge steel with spring loaded door. All you need to do to access your items inside the safe is to enter the code, and the door opens immediately. All in all, here we have a fantastic solution to store your handguns, ammo and other valuable items. It is extremely easy to use the buttons, and this unit is built with quality and durability in mind. 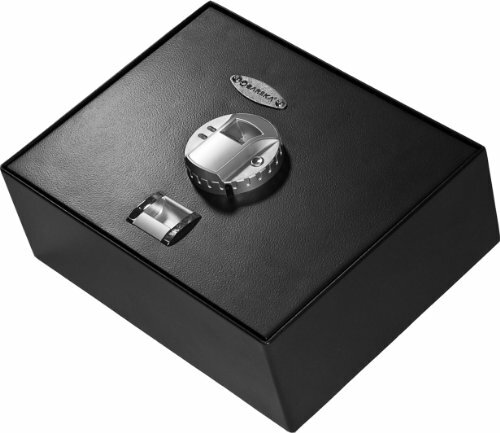 Just like every GunVault gun safe, this unit includes a 5-year warranty against theft and fire. Why Should You Consider GunVault Brand? First of all, they have been in the business for over 25 years, and they know what it takes to build a quality gun safe from premium steel. 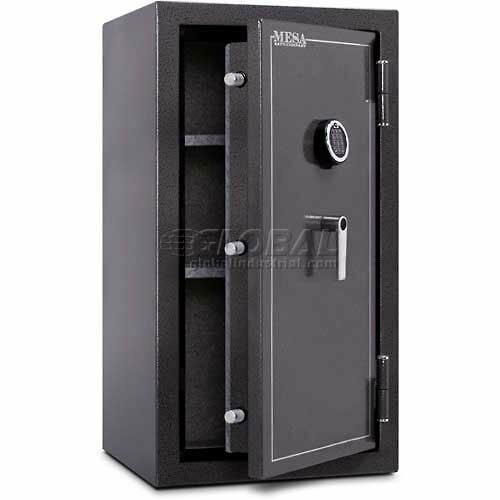 They are the industry leader in security solutions and provide the latest technology in quick access gun safes. 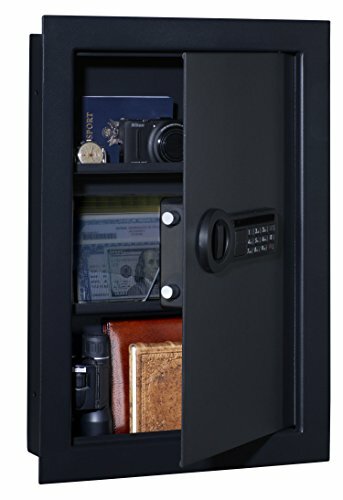 They make gun safes that fit anyone’s demands and offer a wide selection of gun safes, ranging from biometric units to fingerprint options. You can rest assured that if you end up with a GunVault product that you will, without a doubt, receive a premium security gun safe with features that no other gun safe manufacturer can provide. The No-Eyes keypad technology and Bio pad are the latest technological innovations that provide quick and hassle-free access to all your belongings inside the safe. Moreover, the GunVault team is not only the expert in portable gun safes because they are dominating the wall safe market as well. Overall, GunVault is your number one pick if you are looking for a mini, multi or BioVault gun safe. Additionally, if quick-access, along with heavy-duty construction, are your number one features, then you should consider opting-for a GunVault gun safe. The reason is that they perfectly know that security and reliability are something that any gun owner wants in a gun safe. Therefore, GunVault will most definitely have something that matches your demands and needs. As we did mention here above, there are many manufacturers to choose from when you are looking for the perfect gun safe for your home or vehicle. However, it is important that you consider the reputation of the manufacturer that makes your desired gun safe. There is no doubt about it, but GunVault has been the industry leader in the smaller gun safe niche for many years. 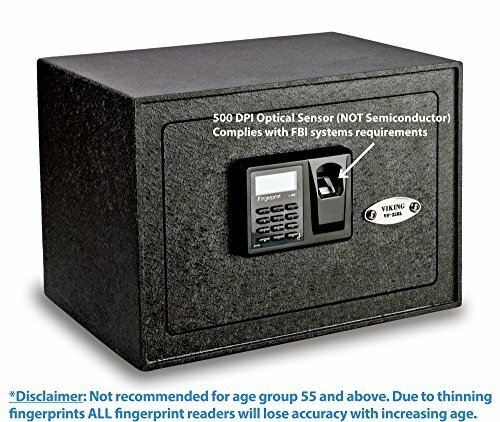 They only provide top-rated gun safes, and they stand by their products 100% by offering you their unique 5-year warranty against theft and fire. Having said that, you need a gun safe to store your firearms and other valuable items. Therefore, you should go for the company that takes pride in their reputation. That way, you will end up with a gun safe that will last for many years to come, and a unit that offers you security solutions that no other brand can match. I hope the GunVault gun safe reviews helped you to make an informed decision and you should be able to pick a safe that fits your needs and style.